The Travel CUTS Challenge is here! Whether you’re well underway or just taking your first steps, Jason Merrithew has some great advice to offer. As the National Manager of Sales & Marketing at Travel CUTS, Jason is responsible for everything from managing contracts to creating and implementing marketing campaigns! He’s also going to be in charge of the Travel CUTS team that assesses completed Challenge submissions – a big responsibility! In addition to the resume-boosting feedback and personalized assessment that come with completing a Challenge, there’s also a unique opportunity up for grabs. The TalentEgg user who submits the most egg-ceptional Challenge solution will start a six-month paid contract at Travel CUTS as a Content Marketing and Social Media Manager! “You’ll be responsible for crafting a content calendar, finding new content, engaging with our online community and taking the initiative to grow our visibility on the web,” Jason says. ➥ Ready to get started? Click to view the Travel CUTS Challenge. Once you’ve proven your marketing skills, this position will be a great opportunity to add to your skill set with workplace experience. “We’re an entrepreneurial organization, so you’ll be given a lot more opportunities and challenges than you might get a larger company,” explains Jason. One of the great things about the Travel CUTS Challenge is that it gives you a chance to tackle a workplace-relevant task while showing a little character. “This Challenge is a great opportunity because you can be yourself. That’s who the market is!” explains Jason. While social media and marketing skills will come in handy, your personal experience as a member of Travel CUTS’ target audience has a lot of value too. “Past experience here is going to be a big driver, as is knowledge of social media platforms and community management skills,” Jason explains. This gives you a unique starting point as you approach this Challenge. What would draw you to a company when planning a trip? • What factors influence my decision to travel? • How do I choose where to book? • What keeps me engaged through the process with my chosen company? These questions start from your personal experience! “The answers to all of those questions are vital to helping you build your marketing plan to reach…yourself: the millennial traveler,” says Jason. Once you’ve finished brainstorming, it’s time to do some research. While you’ll want to put together an unique and engaging idea, it’s important to recognize that fine-tuning details is important and looking at the big picture. “The most difficult part of this Challenge is going to be how to communicate a unique plan in an industry that is supersaturated. Standing out is hard!” says Jason. Jason’s advice? Don’t be afraid to improve on what’s already out there. “See what’s been done before in tourism for advertising and try to evolve those ideas if yours isn’t completely new,” he says. 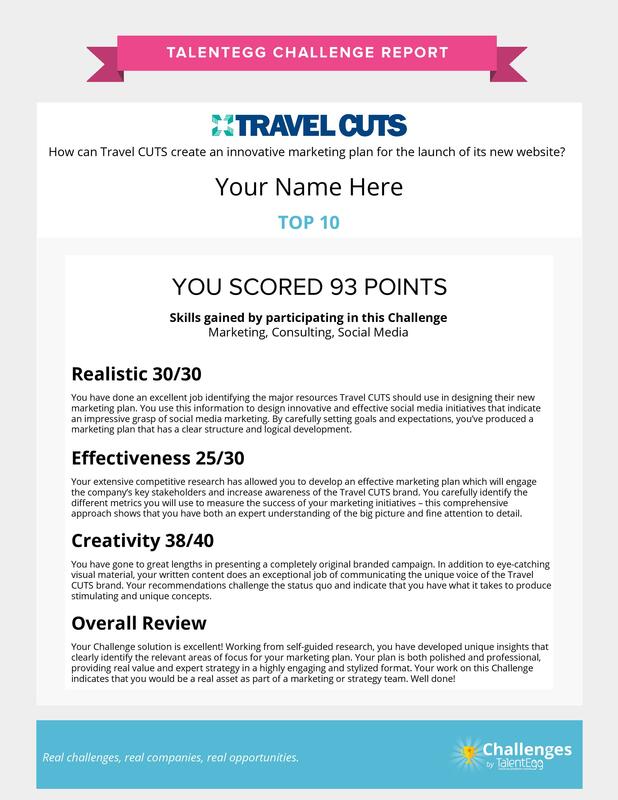 As your ideas begin to take shape, you’ll want to think about matching your Challenge solution to the qualities Travel CUTS is looking for: creativity, originality and thoughtfulness. “We’re looking for motivated people in the right demographic. We figure to market to this demographic, hiring out of it probably makes the most sense!” Jason says. “We’re really strong believers in the idea that anything worth doing is worth doing well,” explains Jason, adding that it’s important to use your personal experience to create an idea you really believe in. If you’ve figured out your “big picture,” take some time to critique your ideas and look for ways to improve. “Ask questions like: Does this plan require heavy investment? Does this idea seem ‘cheesy’?” says Jason. If you’re looking to provide some support for your plan, try looking at more technical aspects, like costs. “Consider the dollar amounts you are proposing to spend and do some research about margins in tourism to see if your ROI calculations are accurate,” Jason says. This research will not only produce a more robust Challenge solution, but will also help you learn and use new skills – one of the key advantages of completing a Challenge! Finally, make sure you’ve looked at the proposed strengths of your marketing plan and identified ways to to measure your performance. “Imagine standing up in front of your boss and saying, ‘Well, it worked, but I can’t show you how.’ Now rethink how you have to define success,” says Jason. It’s this attention to detail that makes the difference between a great Challenge solution, and a Challenge solution that lands you a career opportunity at Travel CUTS. With advice straight from the judging team, you’ve got everything you need to create an egg-ceptional Challenge solution. Get cracking! New to Challenges? Learn more or view the latest Challenges. TalentEgg Challenges Can Beat The Unemployment Challenge. Here’s Why.